How much investment capital do you need to have on your retirement date so that, given some reasonable rate of withdrawal, you will have the income you need—on top of Social Security and any fixed pension benefit you may have—to live comfortably in your very first year of retirement (in today’s dollars)? 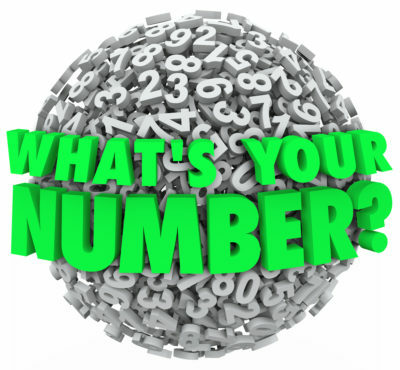 In other words, what’s your number? Let’s further assume that you have no corporate retirement plan or other sources of retirement income other than $2,000 of monthly Social Security, which we assume will be adjusted upward annually for inflation. So you’ll be looking to your investments to generate the remaining $8,000 (in current dollars) each month for that first year. Note that your investments don’t have to yield $8,000 in interest or dividends. Instead, we’re calculating an amount that you’d be comfortable withdrawing each month to support your lifestyle. We also have to account for inflation, which we’ll assume to be 2.25% annually for the next 10 years until you retire. Thus, the $8,000 requirement in current dollars inflates to $10,000 in future dollars. So on an after-tax, inflation-adjusted basis, and as a supplement to Social Security, you’d need $10,000 per month, or $120,000 annually. Now we’re going to make the critical assumption, which is that to try to keep your capital intact and even give it a chance to keep growing, you’ll want to withdraw no more than 4% per year. The so-called “4% rule” is a guideline for determining the amount to withdraw from a retirement account each year. This rule seeks to provide a steady stream of funds to the retiree while maintaining an account balance that should last for approximately 30 years. To determine the required capital sum for our example, we divide $120,000 by 4% [120,000 / .04], which is $3 million. That’s your number—the amount you would need to start with. With $3 million in capital, in most cases, you should be able to withdraw 4% per year to cover your expenses without major risk of exhausting your capital. Keep in mind that this is a rule of thumb and not a guarantee—because the markets are unpredictable, there is no such thing as a perfectly safe withdrawal rate. Once you know your number—where you want to be at retirement— your next task is to figure out where you are right now. In other words, how much do you already have saved for retirement? Then, you need to assess the gap, if any, between those two numbers. Assuming there is a gap, you’ll need to determine how much time you have to close the gap—that is, how long until retirement? Finally, what additional sums can you contribute in the interim? You can run all these numbers on your own, or a financial planner can help you. With those data points, the next step is to calculate the rate of return you’d need to obtain between now and retirement to close the gap and figure out whether that rate of return is realistic. If the required rate of return is not realistic, there are still options. For example, you could retire a bit later than you’d planned or start off at a lower income. A financial planner may be able to help you come up with other alternatives. Using this simple process, you can quickly establish a rough idea of where you are and where you need to get to. Then, with the assistance of either a financial planner or sophisticated planning software, you can determine an appropriate portfolio to get you there. Staying the course with that portfolio (and any rebalancing it may require) over time and through normal market gyrations is another challenge entirely. This is where a behavioral investment counselor can really make a difference. Ensuring that you truly have a lifetime income—not just enough to retire on the day you retire, but enough capital to provide an income that can sustain your lifestyle through a longer retirement than any previous generation has ever had. Proactively planning to achieve that lifetime income—not taking an investment portfolio into retirement and just hoping that it lasts. Although we can’t predict the economy or what markets will do, we can do a pretty good job of planning a portfolio that will weather most storms. Working with a behavioral investment counselor who can help you create a workable plan and then stick with it is a great place to start.